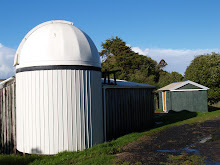 Kumeu Observatory Log: Guttering fix-up. There was a small section of roof about 1.5 meters wide that just ran off the roof and onto the ground running under the building. This now has it's own guttering so it should be drier underneath. There is still an issue with the long gutter run, outside the kitchen, that has a leaky joint in the middle.